Last year I went on a tour of Vietnam with Luke Nguyen. Luke hosts these trips twice a year, and it was a fantastic experience. One thing he taught us was how to make the perfect, restaurant-quality cold roll. In fact, he made our small group make the cold rolls for a dinner for 140 people – the first night of our Mekong River cruise. I made the ones in the photo for a dinner party recently. What I love about cold rolls is that you can put whatever protein you want in them – pork, prawns, chicken. 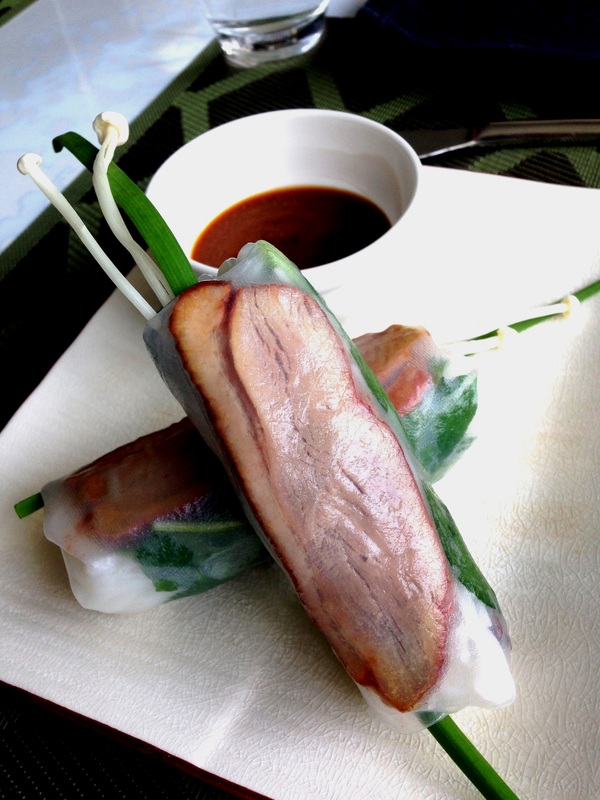 I like to use the Luv-a-Duck Peking Duck Breasts as they’re so convenient and tasty! One of the mistakes I used to make was to leave the rice paper in the water too long. You literally have to just dip the paper in for a few seconds as it will keep softening when you take it out of the water. The secret to a good looking cold roll is to make sure you roll it in such a way that you can see all of the beautiful herbs and meat through the paper. It might take a little practice, but here’s how – enjoy! Luv-a-Duck Peking Duck Breasts, sliced lengthways. Add the noodles to boiling water and maintain a boil – cook for 5 minutes. Turn off the heat and allow the noodles to stand in the water for a further 5 minutes. Strain into a colander, rinse under cold water, then leave to dry. It’s best to have the vermicelli cooked and strained for at least 30 minutes prior to rolling, which allows the noodles to dry off a little and stick together. To assemble the rolls, fill a large bowl with hot water (I use boiling water from the kettle and just add a little cold water) and dip one whole sheet of rice paper into the water and lay it flat on a plate or on your bench. Place the slice of duck horizontally approximately 4cm from the top. 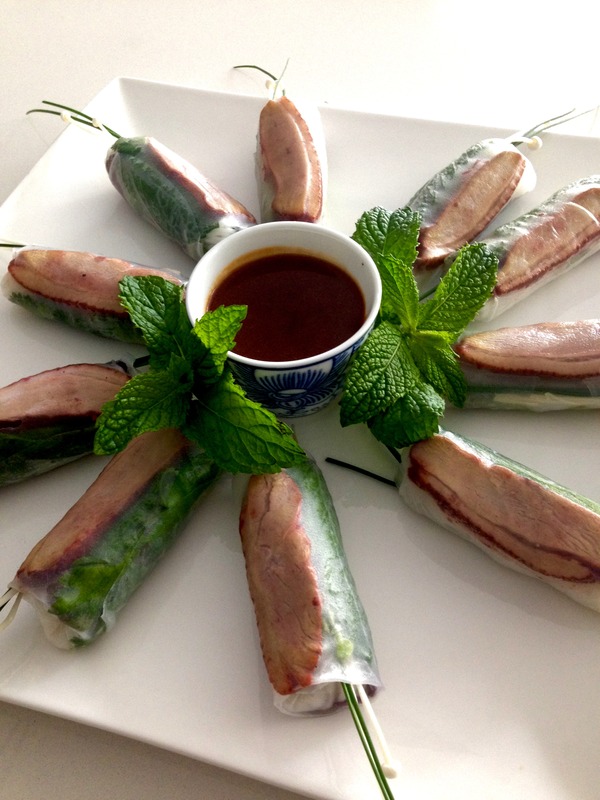 Below the duck, arrange some fresh herbs, lettuce and vermicelli. If you place the ingredients in this order, you will be able to see the ingredients through the rice paper one you roll it. To roll, first fold the sides into the centre over the filling, then fold the bottom of the paper up and roll from top to bottom to form a tight roll. Before you complete the roll, add 2 pieces of garlic chivies and a couple of enoki mushrooms so they stick out one end. To make the dipping sauce, place 1/2 cup hoisin sauce, 1.5 Tbsp rice vinegar and 1/2 cup milk in a small saucepan and stir over medium heat. Continue to stir just before boiling point is reached then allow to cool.